I cannot imagine I'm the only bug-chucker, drift-boating through the blogosphere, that has had it to the top of his waders with the British royals. The news reports started a month or so ago with round table discussions comparing Kate Middleton to Diana Spencer, stories about the future queen's engagement ring, and the likelihood of William ascending the throne before his father. This week, royal watchers have opened the flood gates, and we've been inundated with photos and video of preparations for the big day. She is hot ... I'll give her that. He looks like he could chew his way through a 2 x 4. I've had it, and I think I'm as fed-up as I am simply because so many of my fellow Americans (my wife among them) are so taken with the ostentation and privilege of this royal hullabaloo (I've always wanted to write a sentence using the the word hullabaloo ... check that one off the bucket list). 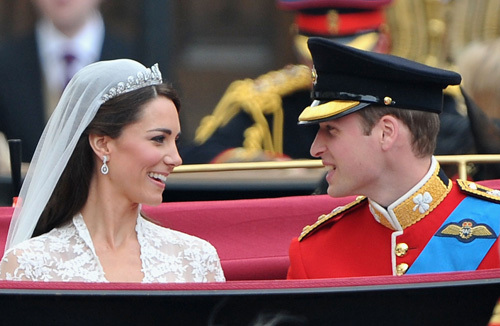 So, while the world watches William and Kate walk down the aisle and exchange their first kiss, I'll be thinking about how lucky I am to be an American, and to live in a place that does not acknowledge royalty - not even a token monarchy like that of our British friends and allies. Why does any of this matter to we bug chuckers? Just consider how very different our lives as fly-flingers could be if we were lorded over by a family of royals. 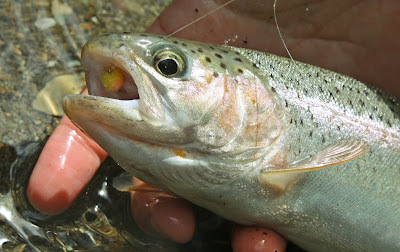 Fly fishing - especially for trout - might be limited to the select few who have the proper breeding. 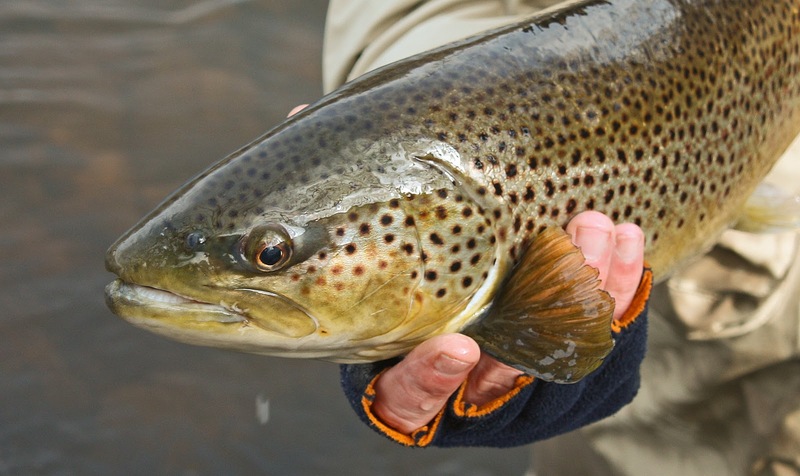 At the very least, the experience of casting a fly on most of America's best trout streams would likely be limited - even more than it already is - to those who could afford to pay an exorbitant price for the experience. Such is the case throughout much of Europe. Ask our British counterparts about the tuition they must pay to fish a beat on the Test, Itchen or Kennet. In our country, we're blessed with some tremendous water, and we all know that as good as the most famous rivers and lakes may be, they're rarely as good as their lesser known and less frequently traveled cousins. The best part about having all that water - and the part we're most inclined to forget - is that more often than not we have rights of access to nearly every inch of it. With that thought in mind, I hope to go into the weekend looking for the silhouettes of little sailboat wings drifting down river. 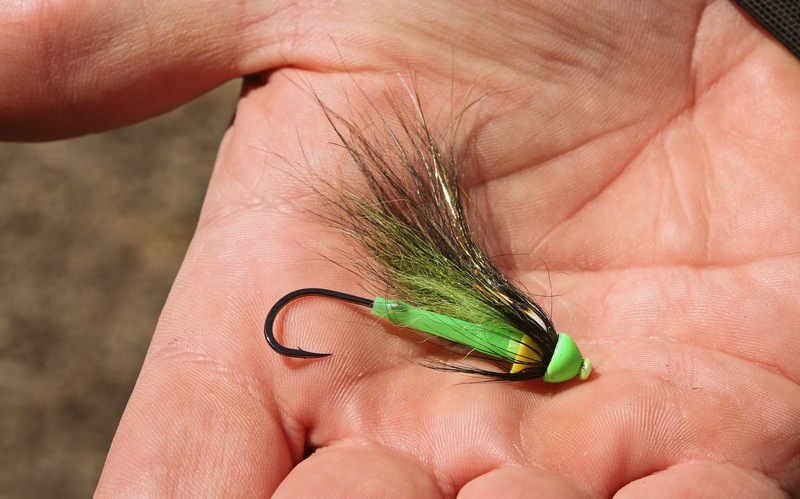 It's hendrickson time, and the bugs will almost certainly be popping. I can only hope the river drops enough to lure some of its brown trout to the surface.If all goes well - and the river, bugs, and fish all play their part - I might just spend an afternoon as king for the day, even though I'll only ever be a lowly commoner, who wears battle scarred waders and smacks 'em on bead heads. The rain decided to hold off for one more day, and I just couldn't resist a chance to hit the river before it swells again. 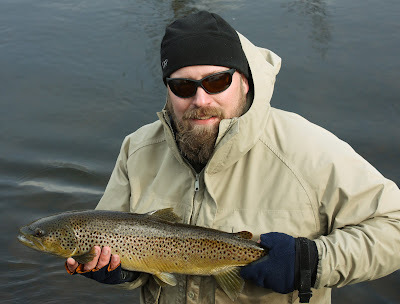 The clarity was perfect for running streamers, even if the water was just a little high and cold. I managed one out-sized brown, that absolutely whalloped my bugger just as the fly hit the end of its swing. Sadly, I somehow managed to snap the tip of my switch rod ... again. If I was asked to guess what happened then I would say that I bent the tip at too severe an angle as I landed the fish. Stupid move on my part (one of many in a series). So it goes ... poo-tee-weet. I think the net gives the photo a little depth, and makes for an interesting effect. Next time I need to remember the polarizing filter. A bit of luck today. Just enough to keep me coming back. 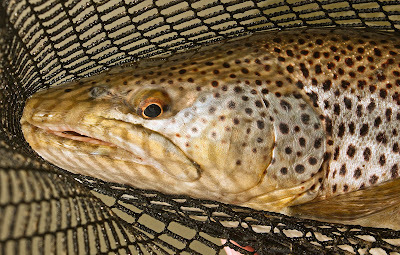 Fly fishing is a business. Think about that for a moment. There's almost a certain ridiculousness to the statement, but it's true nonetheless. 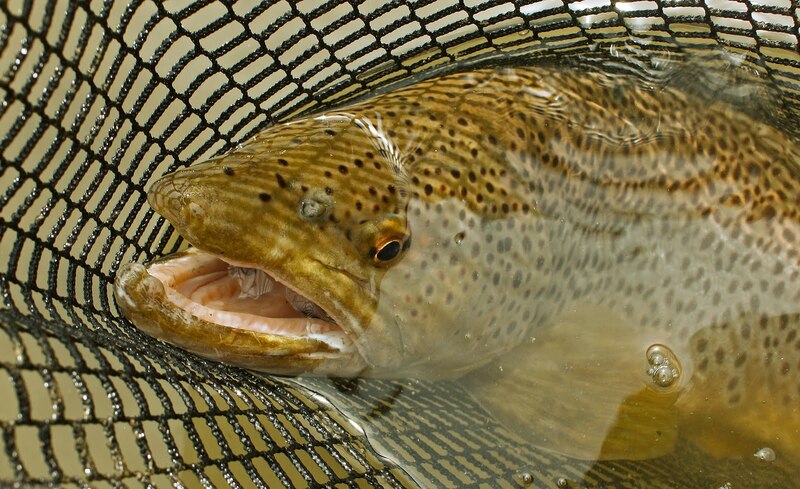 Fly fishing is indeed a business. A sizable group of people, a whole industry in fact, is devoted to the pursuit of fish with the long rod. 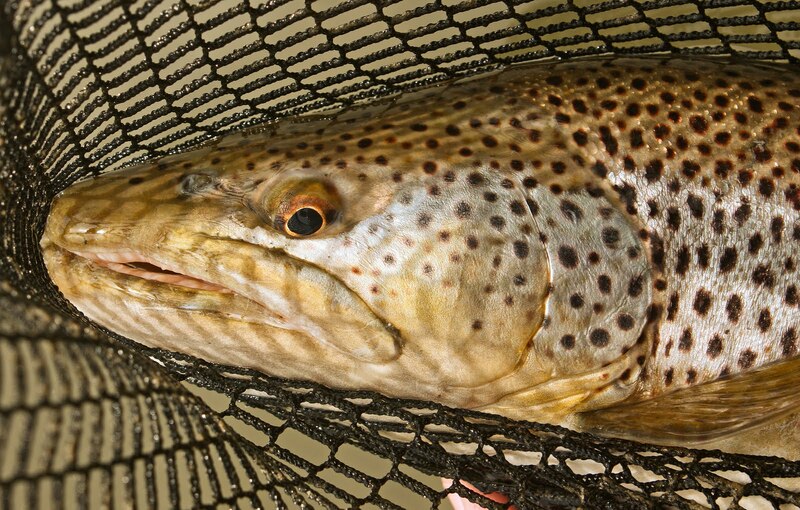 There are the manufacturers of the gear we use, the retailers who purvey that gear, rod designers, fly tyers, tippet dispensers, and a whole host of other folks responsible for bringing the sport of fly fishing to an appreciative market. Somewhere in that list we are obliged to include guides, those folks whose job it is to service - while on the water - the piscatorial needs of novice and veteran bug chuckers alike. I've never been guided nor have I ever been a guide, but I think I can speak on guides with some authority. I worked in a fly shop for a number of years, and in that time I facilitated hundreds of pairings between guides and their sports. I knew which clients were best suited for each of the professionals. For example, Dan worked only with elderly clients. He had a fused spine and limited mobility, and would always take his sports to spots where the water was soft and the wading surefooted and simple. Randy was better suited to the young and nimble. He was a small stream guy who knew his clients could catch 40 or 50 brookies in a day of rock hopping along Furnace Brook. Greg was a north country hillbilly, and the stereotypical mountain man. He was grizzled, something of a curmudgeon, and he knew by name every fish in the rivers he haunted. Greg didn't have the patience to teach, but if the sport already knew the rudiments of casting and reading water then Greg was the man with whom he wanted to be on the water. There were other personalities too, but these three received the lion's share of the business. Could I have done their job? Probably not. First of all, I am much too secretive about the places in which I fish. I share my knowledge - bits of information gleaned over 30 odd years of aimless wandering - with only a select group of friends and acquaintances. In my lean and hungry times I've been tempted to guide on the rivers I love, but when it came right down to it I've never been able to introduce a perfect stranger to my water, regardless of the promised sum. A good guide must be willing to give of himself in a way I never could. As for guiding on some other angler's water ... well ... that just seems the height of hypocrisy. The guides with whom I worked - the best of them anyway - never took clients to water that was shown to them in confidence. Second, I wouldn't want to bet my fortunes on something so fickle as a fish's appreciation of an angler's presentation. Mother nature makes no guarantees, and too often I think, clients have unreasonable expectations of their guides. The guide might be a fine teacher, one who demonstrates the tying of complicated knots, etymology, and local lore. He might row for hours on end, and then force himself to smile through the client's derision when a day on the water proves fruitless. I'm just too short-tempered to deal with that kind of nonsense. I hate to be cliche, but there's a reason we call it fishing. Of course, these are all things done by competent guides, and few guides are genuinely good at their jobs. I suppose as much is true of every vocation or profession. Only a few folks ever take the time to master their craft, most are mediocre and neither excel nor fail, and some are downright dreadful; it's the Bell Curve of the working world. Truly bad guides show up late to the river, and stink of Genesee Cream Ale when they arrive. 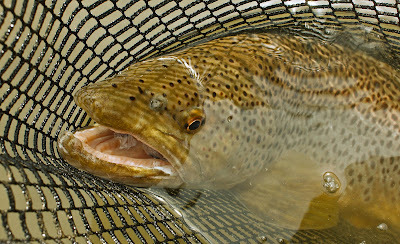 Bad guides fish - uninvited - alongside their sports. 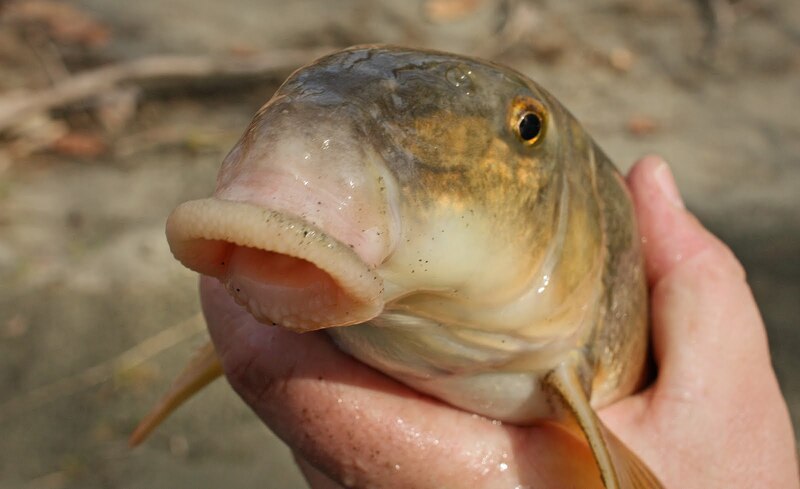 Bad guides pretend familiarity with fish species they've only ever experienced once or twice. Bad guides never clean the empty Slim Jim wrappers out of the boat, or bits of beef jerky from their Copenhagen stained teeth. 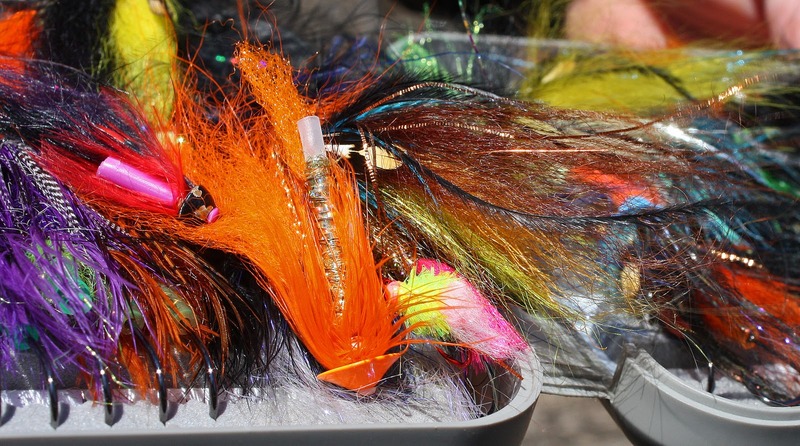 Bad guides do not model courtesy; they encroach on other anglers, and back-troll through the runs that spey guys are working in a methodical cast-step rhythm. Sadly, bad guides abound. Well ... Opening Day of trout season came and went with little fanfare. On Friday the first of April, a severe spring blizzard made an appearance in the mountains. The day was cold, wet, slow at best, and frustrating at worst. While it was good to get out for some stream-bred fish, it was better to chase some lake-run steelhead on Saturday and Sunday. The weather was much more agreeable, and the fish weren't quite so lock-jawed. Of course, no day on the Salmon River passes by without a hitch, and two days on the water are guaranteed to bring twice as many problems. It almost goes without saying to suggest we tasted our share of misery. There was the drift boat guide that decided to park his clients a mere 40 feet to my front while I was swinging a run. 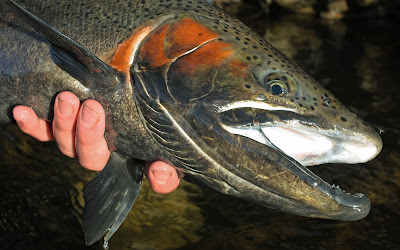 The river gods smiled on me when I managed my first decent cast of the day, and double-speyed my 550 grain Skagit head across both of his sports' back-trolling lines. The curses, cut tippet, and sacrificed fly were well worth the guide removing his boat from the run, and the cosmos returning to relative harmony. Score one for the bug chuckers. One of our party spent the better part of the second night introducing his small intestine to the commode. I understand that after the initial introduction, gifts were exchanged, and a friendship was born that will span both time and distance. We're not sure if it was the beer, lack of sleep, or warm - day old ham that did the trick. Whatever it was, the boy has certainly had better nights, and Brenda's motel is hardly the place one wants to be when one's innards attempt a military coup. 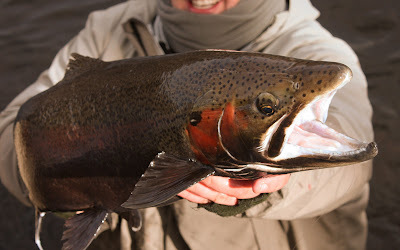 I'd be remiss if I didn't mention Steelhead Ed. Steelhead Ed is every reasonable angler's nightmare. He sells poorly tied flies to fellas who don't know better than to buy from one of the many resident "experts." He storms upstream into the run you're fishing, Pied Pipering four or five of his most obnoxious buddies right along with him. He curses like a meth-head who just smoked his last bump. He saunters right up next to you - close enough to smell your pit stick - and then encourages his buddies to do the same. 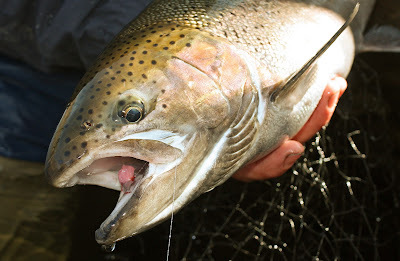 We dealt with Steelhead Ed and his entourage for only an hour before they became unbearable. We packed up our things, and left for quieter water (which we did eventually find). 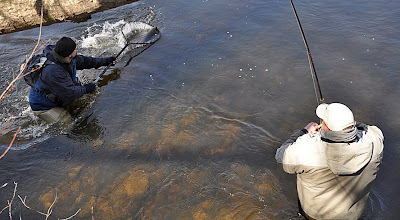 And of course there were all the usual frustrations associated with being on a two-day steelhead bender. There were lost spools of tippet, and fly boxes drifting downstream. There were spilled bags of splitshot, and a small fortune in blue-eared pheasant left hanging in the trees. There was the rebellious reel frame that somehow separated itself from its spool at the very moment a ten-pound hen decided to inhale my partner's prince nymph. At the end of the day, however, we had a genuinely good time. We ate some good food. We drank some truly decent beer, and while one buddy did go swimming to retrieve his spool, no one took an unintended plunge into the drink. The fish were just willing enough to keep us interested, and the sun warmed us whenever the wind blew a little too cold. All things considered, this trip was one of the best.